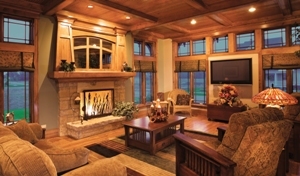 During the dark days of winter, make your home glow and feel warm and cozy with ambient light inside and out. RIGHT LIGHT: Sometimes less is more, even with light. All it takes is a few small upgrades and improvements in lighting to make a huge impact on the warmth and inviting feel of your home. During the cold, dark days of winter, the right lighting is especially important. Using a dimmer will help create the perfect ambience for indoor activities. In a room where a central lighting fixture dominates the space, dimming allows that fixture to provide a more subtle and comfortable light, and lets other fixtures provide appropriate contrast. The addition of a couple of sconces will provide balance. Adjusting the brightness is an easy way to make the space suit most occasions, whether it be a party, intimate conversation or family time. For advice about how to create the perfect ambience with light, visit an ALA-member lighting showroom. SCENE STEALERS: Jewelry-inspired fixtures add modern glamour. 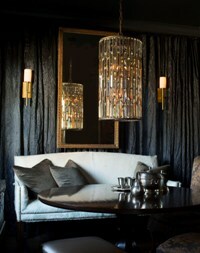 Modern glamour is one of the most popular new looks in home lighting. Many lighting manufacturers are meeting the high demand for this sleek, sophisticated style by making traditional crystal chandeliers more simplified and streamlined, blending well into contemporary as well as traditional settings. 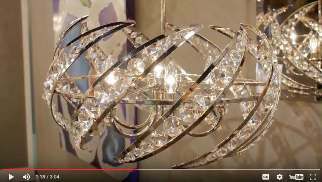 A new video, featuring lighting manufacturer Quoizel, highlights modern glamour designs inspired by jewelry. The new fixtures have integrated LEDs that never have to be changed. With a lifetime of 50,000 hours, the integrated LEDs will outlast the life of the fixtures. To view Quoizel’s video, click here. We are doing a new build with an open-concept design. Seven light fixtures will be seen from the entrance. Should they all match? -Lyndsay B. In reference to fixtures matching in a project, it is generally a good idea to use one concept that connects all fixtures within a space. The fixtures do not have to match exactly, but having one or more design elements that are common to all of the fixtures is a good idea. For example, if you have a design concept that is more modern, it is a good idea to use black/brushed nickel/stainless steel finishes that provide a modern connection. The lines, forms and shapes also can provide guidance on having common relationships among fixtures. However, the decision in a home is always very subjective and depends entirely on your own preferences. Do you have questions about lighting your home? Click hereto submit your questions to a lighting designer. Visit an ALA-member showroom to discuss your lighting needs with a trained expert.